Well I am not certain when I began to love Diva (probably immediately!!) who we had decided to foster her this past June (2007) – wanted to give a senior pug a home, even temporarily.. but we already had 3 pugs, as well as my husband’s Lhasa Apso’s and our terrier mix. So when she 1st arrived she was very shy though friendly and sweet still. Right away I adored her and did not beleive my friends who had warned me not to get too attached to her, well that’s exactly what happened! Though I still kept it in back of my head that our main objective had been to give her a home till a forever home was found but I soon fell in love with her. I think it was because she loved me so much, she cried if I left the room or went in the shower and she did not know where I was. It felt really good and I loved how each day I discovered something new about her. And I loved seeing her (blossom) from a shy and withdrawn pug to a happy and sweet puggie girl who under my care was learning that she was safe and that she was at home with us. But I was realistic to know that maybe hubby was not so attached to her yet BUT..once I let him walk her on the leash and participate in her feeding and daily care, he also fell for her (big time). We had talked for 2 years about getting married and about then decided on a date. And Ross (then my fiancee) called Marcia and surprised me and let her know how we felt about Diva and that we wanted to be her forever parents! So Diva has been here as a foster since late June and as our beloved Diva since only 1 week or 10 days later! That’s all the time it took! I am so thankful for my husband who actually made her a wedding gift to me, and to CPR for having this rescue organization that temporarily or permanently finds homes for these sweet angels. 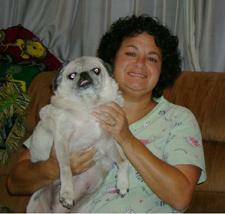 Compassionate Pug Rescue (CPR) is the best and I am so glad that we have added Diva to our family. She is forever at home now and deserves the BEST! Compassionate Pug Rescue is so thankful to Helene and Ross for realizing the immeasurable love that a senior pug can bring and welcoming her into their hearts.